In April, we filmed Molly and Charlie’s Vista West Ranch wedding alongside fellow Style Me Pretty Little Black Book vendor, the talented Nadine Photography. Her beautiful photographs were on Style Me Pretty Texas this Memorial Day weekend along with our classic HD wedding video! While we have been phasing out straight HD videography from our packages since we have such a demand for Super 8 film, we’re always happy to offer straight HD video to couples upon request. Molly and Charlie’s film is a stunning example of a timeless HD wedding video! Molly and Charlie had a beautiful wedding day at Vista West Ranch. While most brides worry about rain in the spring, this day brought something new, but not totally uncommon in Texas: wildfires! So while there was a delay to the start of their day, luckily the rest went off without a hitch! Molly and Charlie were looking for an Austin wedding videographer, and we met them through the lovely Nadine at Nadine Photography, one of my favorite photographers in town due to her dreamy style and easy-going nature. For their photography and videography, they opted for less of the two of them as a couple, formal portraits, and the ceremony, and more of candids during the reception and lots of coverage of their guests having a blast, which thanks to their awesome band, Memphis Train, was a piece of cake! Also, in lieu of the traditional wedding cake, Molly’s mom made hundreds of cookies and pies! Congratulations Molly & Charlie! We wish you all the best! 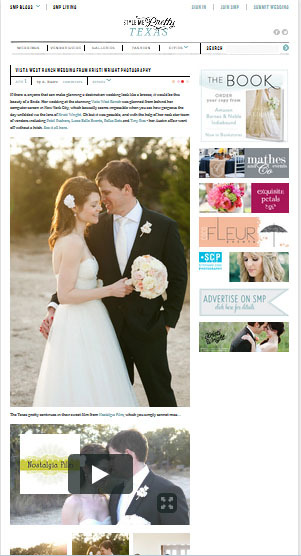 Virginia & Joshua’s Vista West Wedding on Style Me Pretty Texas! Posted on Apr 1, 2013 in featured, HD wedding videography, HD weddings, press, real weddings, wedding videography, wedding videography Austin, wedding videography hill country, wedding videography Texas, weddings | Comments Off on Virginia & Joshua’s Vista West Wedding on Style Me Pretty Texas! Virginia & Joshua’s gorgeous, ethereal, and rustic wedding that we captured this January in HD video at Vista West Ranch is on Style Me Pretty Texas today with photographer Kristi Wright‘s beautiful photos!